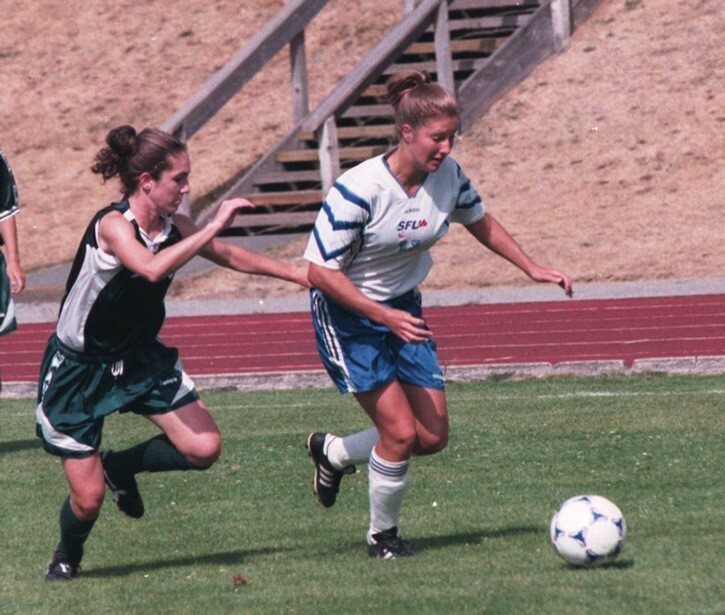 Randee Hermus (right) starred for the Simon Fraser Clan women’s soccer team from 1997 to 2000, helping the Clan win one national championship and finish second another time. Randee Hermus takes pride in her work ethic and effort. She never was the most talented player on the soccer pitch, but what she may have lacked in that department, she more than compensated for though hard work and determination. Hermus represented Canada more than 100 times, including winning a bronze medal at the 2007 Pan Am Games and playing for her country at the 2008 Summer Olympic Games in Beijing. Professionally, Hermus won a W-League championship in 2004 with the Vancouver Whitecaps, picking up most valuable player honours as well. And yesterday (Wednesday) afternoon, the 32-year-old was among the 13 inductees into the Simon Fraser University Athletics Hall of Fame. Hermus admits she never envisioned one day she would be enshrined somewhere for her soccer prowess. “I didn’t even know what that was,” she said about the Hall of Fame, when she first started playing the game as a little girl. “This is quite the honour to be inducted as an individual athlete. “I was just a player with a lot of grit, a lot of intensity and hard work,” she said. 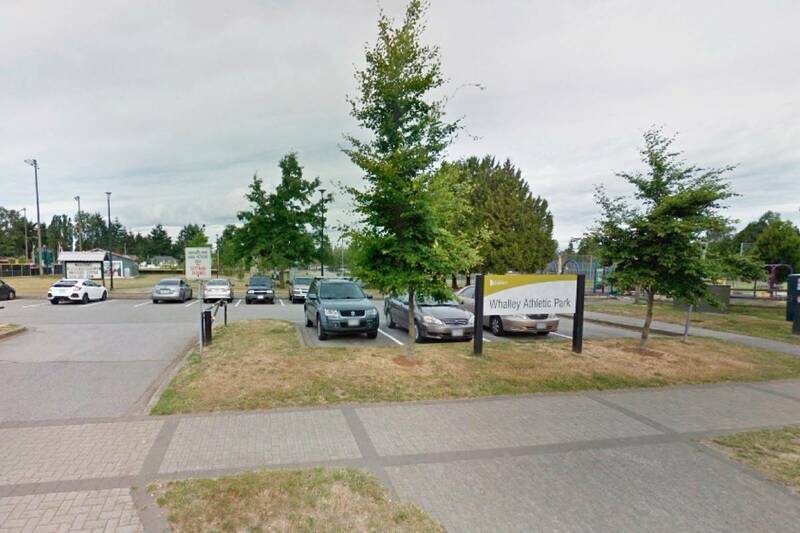 After graduating from Langley Secondary in 1997, Hermus landed a scholarship to Simon Fraser University. It was in Burnaby where Hermus felt her game really blossomed. “I came into the Simon Fraser program not really knowing what to expect and that is sort of where my career really flourished,” she said. Long-time SFU coach Shelley Howieson called Hermus “a backbone” of the program during her time at SFU, from 1997 to 2000. “You can kind of pick out the players who are going to do something special and Randee was certainly that person,” Howieson said. As a freshman, Hermus, a centre-midfielder, helped SFU reach the national championship game. She capped her collegiate career by winning a national title for the Clan in 2000. After that, Hermus played professionally for the Vancouver Whitecaps, as well as continuing to play internationally for Canada. “She was very goal oriented,” said Pat Rohla, who coached her at high school with the Saints, as well as for a few seasons with the Whitecaps. He described her as strong-willed, motivated and talented. “All the ingredients she needed to be successful,” Rohla said. Hermus still recalls her first experience at a national team camp, which was held in the barracks in Esquimalt. She was just 18 at the time. “I remember crying and just wanting to go home,” she said with a laugh. But she persevered and stuck with it. “At that point, I was still very raw; I wasn’t given the gift of extreme talent but I had the hard work and the soccer brain and over time, my development from all of my coaches, everybody contributed at some level in different ways. The influential coaches included Howieson and Rich Sumner at SFU, John Judd and Ajay Patel with the provincial team program, Jeff Clarke with Surrey United, Ian Bridge, Neil Turnbull and Evan Pellerud with the national team, and Rohla and Chris Bennett with the Whitecaps. She also thanked mentors such as Silvana Burtini and Geri Donelly, as well as her parents, John and Veronica, and brothers John and D’arcy. Teammates at every level also made a significant impact, especially Miranda Zilm, who played alongside Hermus on some provincial teams and with SFU. She remains Hermus’ best friend. Others she mentioned by name included Megan Blaker, Sara Magilo, Katie Thorlakson, Christine Sinclair, Amy Walsh, Karina LeBlanc and so many more. Hermus hasn’t played for the national team in a few years and last played for the Whitecaps in 2009. She has played for Surrey United’s Premier team the past couple of years, but retired in October after helping the team win nationals. But she is still in the game, coaching the U13 Fusion FC, a Vancouver/Richmond girls squad which plays out of the high performance B.C. Soccer Premier League. Hermus recalls she was at this age when former national team player Heidi Slaymaker came out to help coach a provincial team Hermus was on. “That was the first time that I actually realized that the national team was an option,” Hermus aid. Randee Hermus represented Canada at the 2008 Summer Olympics in Beijing.The 31-year-old from Langley was inducted into the Simon Fraser University Athletics Hall of Fame this week.